Mr. David Leong, creator of Cashew Chicken [photo courtesy of leongsasiandiner.com]. During our Christmas holiday travels we visited family in Southwest Missouri. One evening we chose Leong’s Asian Diner in Springfield, Missouri. As we were seated, my Dad whispered to me, “Do you know who that gentleman is?” referring to an older man seated alone with two hands resting on a cane. After I said I didn’t, Dad said, “Well, that is David Leong himself.” When I looked confused, Dad stated, “He is the Original! He created Cashew Chicken.” We continued with our conversation, but shortly I felt the urge to go over and talk with him. He noticed me approaching and smiled when I asked if I could talk to him. During our brief chat, Mr. David Leong told me that he had lived in Springfield since 1955. 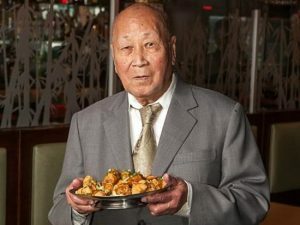 In 1963 he had created his signature dish, Cashew Chicken. The dish happens to be a favorite of mine. Springfieldians will find this an old story, as articles in the New York Times (2009), Feast Magazine (2015) and the Springfield News Leader (2018) have featured Mr. David Leong and his culinary creation. However, many of you may not be aware of the role he played in defining Chinese cuisine far beyond Springfield, MO. Wing Yan Leong arrived in the United States in 1940, after making the heartbreaking decision to leave his wife and child in his home province of Guangzhou. China was already in the midst of war and the United States had strict immigration restrictions for Chinese citizens. Wing Yan’s father was living in America and encouraged his son to come to make a way for his family to join him. Shortly after arriving, Wing Yan Leong joined the U.S. Army as a cook. Serving his new country during World War II did require adjustments. His given name was difficult for his commanding officer to pronounce, so Wing Yan Leong became David Leong. He became a naturalized U.S. citizen in 1977. After the war his family joined him in Pensacola, FL where he worked in a restaurant. A visiting neurosurgeon from Springfield, Missouri offered to double David’s salary if he would move and serve as chef in the doctor’s restaurant. Mr. Leong readily agreed without even the knowledge of where Missouri was located. He worked for others until he could open his own restaurant in 1963. He knew that Asian cuisine was new for many Americans and that he needed to tie familiar tastes into his dishes to gain local approval. He discovered chicken fried steak was a regional favorite and from this he took the idea of frying small chicken pieces and serving them in a rich brown sauce made from chicken stock, oyster sauce and soy sauce, then topping it with green onions and cashew halves. His recipe was an immediate hit. Cashew Chicken created loyal customers for Leong’s Tea House, but David refused his family’s pleas to keep his recipe secret. He regularly shared it with others who would compete with his restaurant in Springfield. Over the years he would see “Springfield-Style Cashew Chicken” not just on menus across Missouri, but from San Francisco to Hong Kong. It was such a pleasure to meet such a generous man. David lives by a creed he learned from his mother: “If you are good to people and you help them — you are going to live a long life.” At 98, David Leong is living proof. If you are curious about the recipe you can buy a jar of the original here. Ettie Berneking. “How David Leong Invented Springfield-Style Cashew Chicken.” Feast Magazine. 2 March 2015. Ancestry.com. Northern District, Illinois, Naturalization Index, 1926-1979 [database on-line]. Lehi, UT, USA: Ancestry.com Operations, Inc., 2017. Steve Pokin. “The life of David Leong: From an arranged marriage in China to a place called Missouri.” Springfield News-Leader. 16 May 2018.